A good friend and client, Kerry Spindler of KSpin Designs, wanted to give back to something that gave her everything. You can read her story here: www.prettypale.com . After our fabulous shoot last February, we knew we had to do something to not only top it, but continue to raise awareness of the preventable and deadly form of cancer, called Melanoma, or skin cancer. 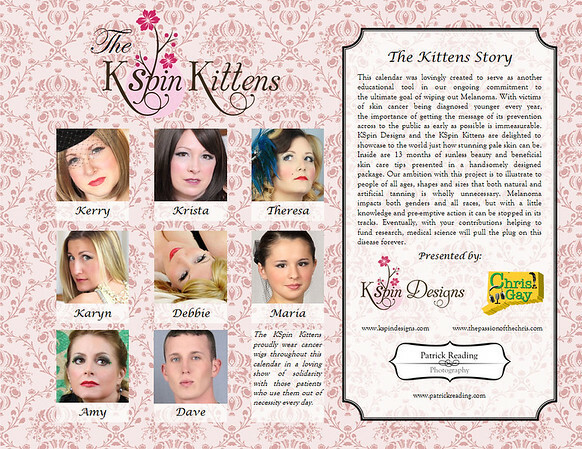 So, in conjunction with the summer Trunk Show and Fundraiser, we gathered together the Kspin Kittens again, and put together a 13 month 2012 calendar, promoting the beauty of pale skin and safe sun care. This is no ordinary calendar. Sure, it has a place for taking notes. Yes, it has lots of space for appointments and events. It'll tell you when the holidays are, and when you can take a day off work. But its got two things that NO other calendar has. One: it has tips and ideas for keeping your skin safe and healthy, regardless of whether you want golden skin or alabaster, and two: It has 13 months of the beautiful KSpin Kittens! Don't take my word of it. Here are some teaser shots. Take a look, and then go to the Pretty Pale site and order one for yourself! Decembers Feet... Those shoes are to die for! We Added a Tom Cat to the Kittens Lineup for July. It wouldn't be August with out a little time at the beach. The back cover with all our lovely models. I'd like to thank Kerry Spindler and the Spindler family for their support in this effort, all of the Kittens for their involvement, and our calendar writer, Chris Gay for his efforts in bringing together this team effort. Order yours today, and contribute to the cure.